2012 VW Up Black review | What Car? 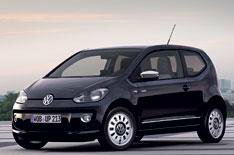 The Volkswagen Up Black is the top-of-the-range version of the 2012 What Car? Car of the Year, the VW Up supermini. The Up Black is mechanically identical to our favourite version of the car, the three-door High Up, but it comes with a host of cosmetic tweaks for a 790 premium. On the outside, the Up Black features 16-inch alloy wheels, chrome detailing, Deep Black metallic paint, tinted rear windows and a 'Black' logo. If black is not for you, there's a similarly specced Up White range-topper, with white paint and detailing. What's the Up Black like to drive? The Up Black is powered by a 74bhp 1.0-litre three-cylinder petrol engine, which is impressively smooth and quiet, with just enough puff to make the car fun to drive. The five-speed gearbox is slick and precise, and the steering is linear and nicely weighted light enough to make town manoeuvring easy, yet heavy enough to give the car a feeling of stability on the motorway. The Up Black has bigger wheels than other versions, but the ride is still well judged because it mops up potholes with ease and body movements are well controlled. What's the Up Black like inside? The Up Black gets a leather-trimmed steering wheel, a black dashboard, black carpet mats with black and white edging, and Up logos on the doorsills. Otherwise, you'll find the Up Black is the same as the High Up, so the dashboard is uncluttered and easy to use, and you get a terrific (and removable) sat-nav infotainment system. The driving position is comfortable, although the steering wheel adjusts only up and down, not in and out. The Up is well packaged, so front and rear space is good compared with that in other city cars, and the boot is one of the biggest in the class. The Up Black is well equipped, too; buyers get stability control, air-con, front electric windows, heated front seats, electrically adjustable and heated door mirrors, and front foglights. Should I buy an Up Black? This range-topping Up costs 11,180, which is 790 more than our favourite High Up. That's a significant hike, but the car is well equipped and it will hold its value well. Whether you should choose the Up Black over a High Up largely comes down to whether or not you like the 'Black' styling touches. Overall, we'd stick with the High Up and use the savings to get metallic paint and VW's 300 servicing package.